‘Woah Dave!’ Review: Ohhhhhhh Yeah! Super Crate Box ($1.99) has definitely spawned a few games inspired by it, to say the least, though games cutting too close has been a sensitive subject. But the game owes a lot to the original Mario Bros. in terms of structure, and Woah Dave ($4.99) from Choice Provisions, the former Gaijin Games, manages to take more after Nintendo’s original than Vlambeer’s modern. And it does a great job at making its own blend of challenging survival and situation management that I quite enjoyed. Players control Dave, who has a problem with creatures hatching from eggs and then just running around like they own the place. So, he must take them out, either by tossing other eggs at them, or using the exploding skulls. In terms of utility, the skulls surpass the eggs because they’re all killer, no filler, though don’t be holding them or near themn when they explode. The eggs can kill creatures that spawn, so they’re useful if no skulls are available. 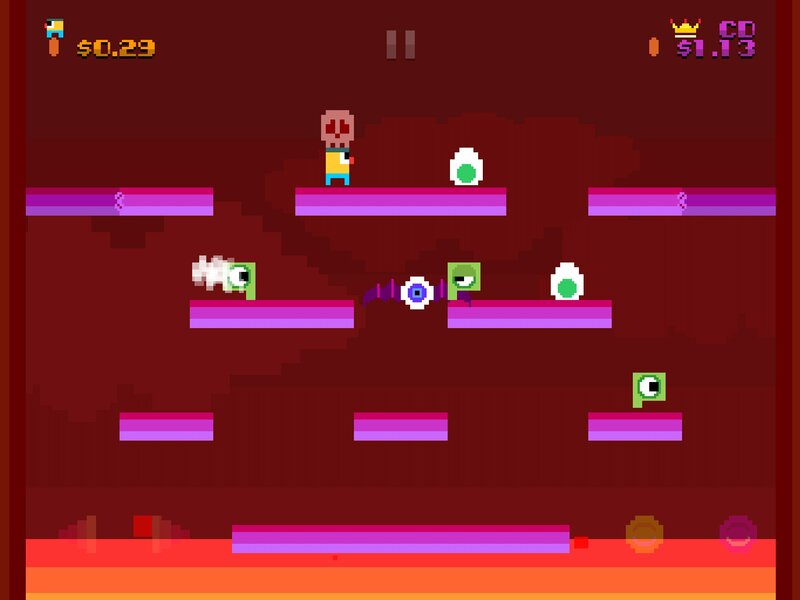 Creatures that fall into the fiery abyss below will come back faster and more powerful – but also worth more coins, which determines score. Essentially, the game becomes about managing the chaos much in the way that Super Crate Box was about. Getting rid of an egg before it hatches, whether by skulling it or throwing it into the abyss, is usually a good idea because enemies are a one-touch kill, though there are three lives at least. Occasionally, there will be a bunch of eggs and no skulls, so managing them, taking care of whatever pops up is important for getting high scores. That, and the item being held blowing up while being held isn’t a good thing either. There are indicators for that, at least! It’s that strategic aspect to the game that I really quite enjoy. 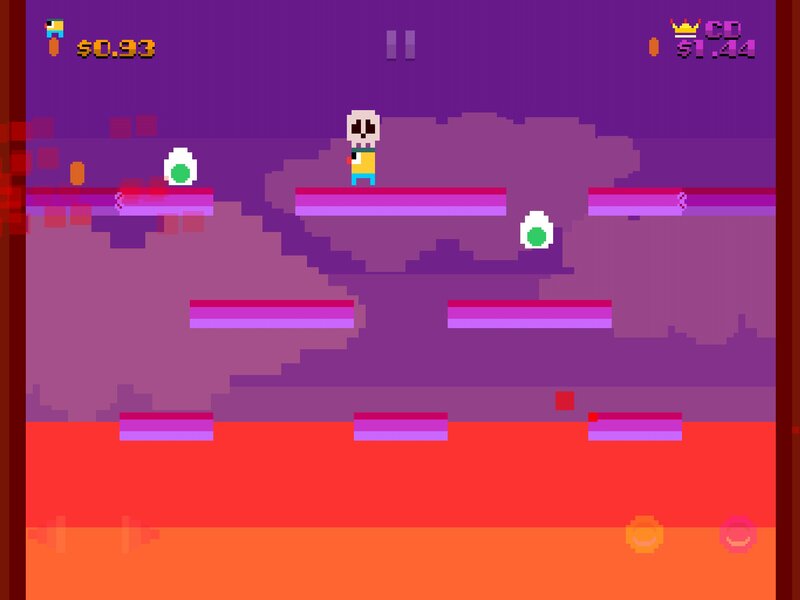 The game ramping up in difficulty as the bottom floor gets consumed by lava, which can be delayed by throwing eggs or skulls into it, makes sure that it’s impossible to just kind of do nothing for a while. I recommend for those who have played Super Crate Box and gotten some skill at it, to delete and reinstall the game. It’s absurdly easy with only the starting weapons in part because the rocket launcher is rolled more often, and crowd control is a lot easier having, that, a better idea of what is coming, and the fact that the game never actually gets harder. Woah Dave instead cleverly finds a way to keep the premise the same over time as far as skull and egg drops go, with the same performance needed, but making the situation it takes place in more difficult over time, as once that floor turns entirely to lava, enemies will come back as their more powerful forms more often. There’s one gameplay mode available until a score of 150 is attained, and that means get ready to hammer down through the main mode again and again until it’s unlocked. Generally, making it that long just requires not making stupid mistakes up until the point when the lava disappears, and the UFOs come and destroy platforms, making the situation much more chaotic than it once was. This is definitely a game of “keep your head while all around are losing theirs." And to also quote Rudyard Kipling, “Get good, noob." I do wish that the lava could be managed a bit more than it is now, maybe if tossing eggs or skulls would get more of the floor back than it currently gets. I like what Woah Dave does for touchscreen controls, while there’s the default virtual buttons that can be placed anywhere, give the Pro Dave controls a try from the options. This makes the buttons move around while playing, so ideally the move arrows and jump/throw buttons are where they’re expected to be based on the last time they were touched, not based on their actual physical position. This system can get a bit screwy at times if moving a finger too far, but it’s mostly good. It’s just the bad will be killer. There’s also MFi gamepad support, which I always approve of, especially in games that are also on systems with physical controls like this Woah Dave is. For those who enjoy arcade-style games, and I’m talking original Mario Bros. style, Woah Dave is a must, it’s a great game to sink a lot of time into again and again. Previous PostPrevious Blizzard Teases ‘Hearthstone’ Demolisher Plans for BlizzCon?